Graphene is a thin layer of pure carbon, tightly packed and bonded together in a hexagonal honeycomb lattice. It is widely regarded as a “wonder material” because it is endowed with an abundance of astonishing traits: it is the thinnest compound known to man at one atom thick, as well as the best known conductor. It also has amazing strength and light absorption traits and is even considered ecologically friendly and sustainable as carbon is widespread in nature and part of the human body. Graphene is often suggested as a replacement for activated carbon in supercapacitors, in part due to its high relative surface area (which is even more substantial than that of activated carbon). The surface area is one of the limitations of capacitance and a higher surface area means a better electrostatic charge storage. 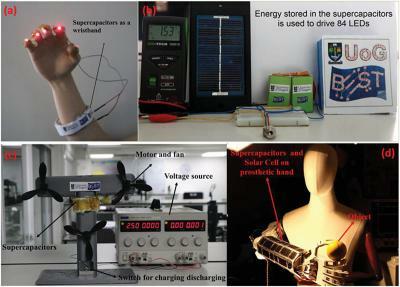 In addition, graphene based supercapacitors will utilize its lightweight nature, elastic properties and mechanical strength. Graphene-based supercapacitors are said to store almost as much energy as lithium-ion batteries, charge and discharge in seconds and maintain all this over tens of thousands of charging cycles. One of the ways to achieve this is by using a a highly porous form of graphene with a large internal surface area (made by packing graphene powder into a coin-shaped cell and then dry and press it). Supercapacitors, also known as EDLC (electric double-layer capacitor) or Ultracapacitors, differ from regular capacitors in that they can store tremendous amounts of energy. A basic capacitor usually consists of two metal plates, separated by an insulator (like air or a plastic film). During charging, electrons accumulate on one conductor and depart from the other. One side gains a negative charge while the other side builds a positive one. The insulator disturbs the natural pull of the negative charge towards the positive one, and that tension creates an electric field. Once electrons are given a path to the other side, discharge occurs. Supercapacitors also contain two metal plates, only coated with a porous material known as activated carbon. They are immersed in an electrolyte made of positive and negative ions dissolved in a solvent. One plate is positive and the other is negative. During charging, ions from the electrolyte accumulate on the surface of each carbon-coated plate. Supercapacitors also store energy in an electric field that is formed between two oppositely charged particles, only they have the electrolyte in which an equal number of positive and negative ions is uniformly dispersed. Thus, during charging, each electrode ends up having two layers of charge coating (electric double-layer). Unlike capacitors and supercapacitors, batteries store energy in a chemical reaction. This way, ions are inserted into the atomic structure of an electrode, instead of just clinging to it like in supercapacitors. This makes supercapacitors (and storing energy without chemical reactions in general) able to charge and discharge much faster than batteries. Due to the fact that a supercapacitor does not suffer the same wear and tear as a chemical reaction based battery, it can survive hundreds of thousands more charge and discharge cycles. Supercapacitors boast a high energy storage capacity compared to regular capacitors, but they still lag behind batteries in that area. Supercapacitors are also usually more expensive per unit than batteries. Technically, it is possible to replace the battery of a cell phone with a supercapacitor, and it will charge much faster. Alas, it will not stay charged for long. Supercapacitors are very effective, however, at accepting or delivering a sudden surge of energy, which makes them a fitting partner for batteries. Primary energy sources such as internal combustion engines, fuel cells and batteries work well as a continuous source of low power, but cannot efficiently handle peak power demands or recapture energy because they discharge and recharge slowly. Supercapacitors deliver quick bursts of energy during peak power demands and then quickly store energy and capture excess power that's otherwise lost. 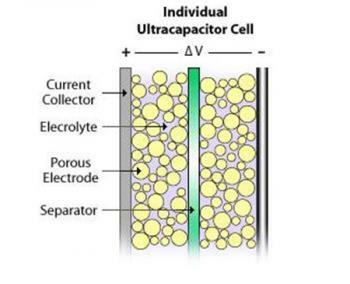 In the example of an electric car, a supercapacitor can provide needed power for acceleration, while a battery provides range and recharges the supercapacitor between surges. Supercapacitors are currently used to harvest power from regenerative braking systems and release power to help hybrid buses accelerate, provide cranking power and voltage stabilization in start/stop systems, backup and peak power for automotive applications, assist in train acceleration, open aircraft doors in the event of power failures, help increase reliability and stability of the energy grid of blade pitch systems, capture energy and provide burst power to assist in lifting operations, provide energy to data centers between power failures and initiation of backup power systems, such as diesel generators or fuel cells and provide energy storage for firming the output of renewable installations and increasing grid stability. Several materials exist that are researched and suggested to augment supercapacitors as much (or even more than) graphene. Among these materials are: hemp, that was used by Canadian researchers to develop hemp fibers that are at least as efficient as graphene ones in supercapacitor electrodes, Cigarette filters, which were used by Korean researchers to prepare a material for supercapacitor electrodes that exhibits a better rate capability and higher specific capacitance than conventional activated carbon and even higher than N-doped graphene or N-doped CNT electrodes. 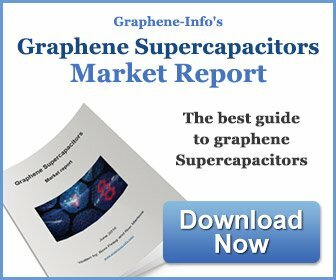 Graphene supercapacitors are already on the market, and several companies, including Skeleton Technology, the CRRC, ZapGoCharger, Angstron Materials and Sunvault Energy are developing such solutions. 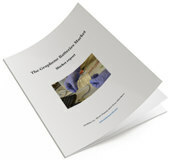 Read our Graphene Supercapacitors market report to learn more about this exciting market and how graphene will effect it. Ionic Industries has developed a number of prototype supercapacitor devices using its graphene technologies, and following is a video of one of these devices in operation. Ionic states that these graphene-enhanced supercapacitors are inexpensive, safe and environmentally friendly and have the potential to power a broad range of Internet-of-Things devices (which are the markets that Ionic will be focusing on in the near term).